What is pop culture? Pop culture is commercial culture based on popular taste. Popular culture allows large groups of people to identify collectively – building a sense of community. Pop culture appeals to people because it provides opportunities for both individual happiness and communal bonding. Examples of popular culture come from a wide array of genres, including popular music, print, Internet culture, sports, entertainment, leisure, fads, advertising and television. Take a few minutes to engage with these questions. What types of pop culture most influence you? Why do you gravitate toward these types of pop culture? Do you bond with others through pop culture? Have you ever identified concepts, ideas, or themes that tie into the gospel while engaged in pop cultural experiences? The Greek people were very spiritual. They would spend time debating, expressing, conceptualizing, and learning about anything spiritual. This was their pop culture. 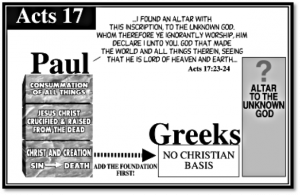 In Acts 17 we find Paul masterfully engaged in the pop culture of the Greeks. His goal was to point them to the need for more than what they knew, which would lead them to a crisis of belief. Do they follow what they know or embrace the gospel? The pop culture of today has become the new spirituality. We, like the Greeks, want nothing more than to debate, express, conceptualize, and learn as much as we can about our new spirituality: music, print, Internet culture, sports, entertainment, leisure, fads, advertising and television. The beautiful thing is the same approach that Paul used in the New Testament applies today. We can engage our pop culture and point people to the gospel. The storylines of pop culture are ultimately the same not matter what the topic or medium. Each storyline seeks to answer questions that resonated with the core of who we are as people. The beautiful thing about the gospel is that it parallels pop culture’s storylines. With an understanding of the gospel we can engage our culture in the most non-confrontational ways, and point people to the life changing power of the gospel message. These are questions to ask as you assess how the gospel relates to pop culture. What's false and ugly and perverse about it? What's good and true and beautiful about it? How does the gospel apply? What ongoing conversations are you having that God could use to point people to the gospel? What would it take for you to begin to have a gospel focus when you engage pop culture? What is your one take away? How does this further direct you to live out the gospel?